November 12th, 2016 – Meet Our Holiday Market Event Vendors! | Faddegon's Nursery, Inc.
November 12th, 2016 – Meet Our Holiday Market Event Vendors! Oct 31, 2016 | What's New? Join us and these great vendors for our Holiday Market Event – November 12th, 2016 – 10 a.m. to 4 p.m.
Arbonne transforms lives through pure, botanically based ingredients in scientifically tested products; a pure, healthy lifestyle; and the pure joy of helping others. From the beginning, Arbonne has developed products by combining the best of nature with leading science. Their mission is to always improve and evaluate their ingredient policy as an ever-evolving standard of excellence. This means they continuously challenge themselves to do better and better. How do you make the best cheese and yogurt there is? Start with cows fed with forages grown especially for them and who have never seen a synthetic hormone. Raise your 50 cow herd on your own family farm. Make every bit of the cheese, yogurt, and other dairy products yourself in your on-site facility. This is how Marge and Dave Randles make products such buttery Caerphilly, creamy yet sharp Mercy cheese, Sweet Greek Yogurt, and a variety of cheese spreads. If you love extra virgin olive oils, Infused olive oils, and Balsamic vinegars then you won’t have very far to go to explore rich tastes and gastronomical treats. Owner, Erin Popeleski, has recently opened her shop right here in Niskayuna filled with products such as Vermont Maple Balsamic Vinegar and Roasted Pumpkin Seed Oil! Erin has other great specialties too – try Annemarie’s Jamboree jam and Sweet Potato Orzo from Flour City Pasta! We’re so glad Erin is joining us. Henry Loves Betty is a pet boutique taken to the next level. It’s the brainchild of Paula Matt who has a passion for pets and sells handmade, holistic and high-quality pet foods, toys, treats, apparel and accessories for both dogs and cats. Stop in to shop, set up dog walking or pet sitting services or just to say hello and show off your furry friend! Paula has a background in both fashion and veterinary sciences so she understands every facet of your pet relationship. All you have to do is take a look at the reviews for Innovo Kitchen to know that Chef John LaPosta has created a truly unique restaurant experience! Best described as a “gastropub”, Innovo Kitchen’s menu contains items such as Birch beer braised short ribs, parmesan tater tots and savory waffles. A passion for hospitality and food is the earmark of Innovo. Don’t miss this chance to sample some of Chef LaPosta’s best! Gourmet popcorn doesn’t even begin to describe the rich handcrafted taste of Kernel Cravings’ caramel corn. How does ButterCrunch, Dark Chocolate & Sea Salt or Saigon Cinnamon caramel corn sound? We can’t wait to try these and other confections! Butter toffee cashews sound pretty darn amazing too! You must check out Kernel Cravings’ offering made with only the best ingredients! How does phyllo dough filled with walnuts and cinnamon and then drizzled with syrup sound? It’s paklava and it tastes even better than it sounds especially when it’s made from scratch according to Laura’s Armenian family recipe! 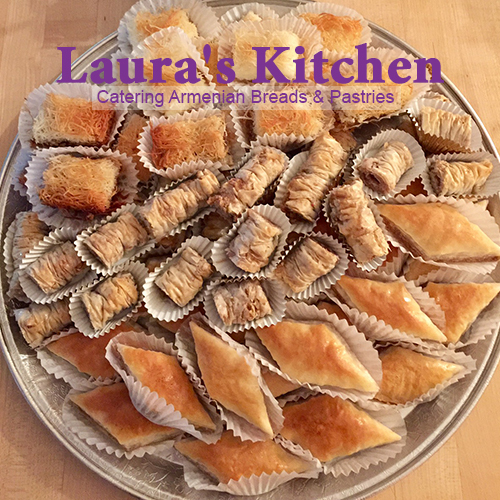 We here at Faddegon’s have been secretly enjoying Laura’s treats and now everyone will get to experience these amazing breads and pastries! Laura will be here with samples and order forms. Don’t leave without trying her soft Armenian braided rolls! Lexi McCarthy discovered the amazing results of this woven cloth in 2013 quite by accident! A robe her mother-in-law had given her was the beginning of her journey to bring The Makeup Eraser to the cosmetics market. The cloth is soft and gentle – just wet the cloth with warm water and your makeup is easily removed, including waterproof eyeliner, 3D mascara and even face paint. Cindy Schulz will be here to show you how this eco-friendly and reusable cloth works! Family owned and operated by the Darrow family, Saratoga Apple, has been in the apple business for 5 generations! Located on Route 29 between Saratoga Springs and Schuylerville, you will find a vast array of apple varieties and products. William’s Pride, Blondie and Fortune are just 3 of the many great varieties grown with great care, using low-spray techniques and micronutrient fertilization, including sea minerals and rock dusts. They have just launched two of their own hard ciders which will be available to taste and purchase. If you’ve never been to The Sweater Venture then this is your chance for an introduction to the most amazing collection of knitwear, textiles, accessories, gifts and more. The Sweater Venture has been working cooperatively with indigenous artisans from around the world since 1978. A commitment to promoting traditional products and fair trade is a priority for The Sweater Venture as well as bringing beautiful creations to the Capital Region. Located 284 River St. Troy, NY , the Broken Mold is a both a retail shop and a learning space! The atmosphere at the Broken Mold is one of creativity, light, and art showing off the many bowls, vases, and other unique pieces offered for sale. After you come to see this wonderful pottery at Faddegon’s you can sign up at The Broken Mold Studio to make your own! Theresa Girzone King has been designing and handcrafting jewelry for nearly two decades. Theresa is noted for her intuitive sense of color and combination and for her balanced use of organic and geometric forms. By blending her hammered, bold silver designs with carefully selected and uniquely patterned pearls and semi-precious stones, she’s able to create some of the most original and extraordinary pieces available. Leah LaFera is the soapmaker & owner of Ulster Soaps. Selling locally and on Etsy, Leah creates her amazing soaps using mostly certified organic ingredients and pure essential oils. Create your own spa experience with Orange Ginger Salt Glow, Honeysuckle Comfrey or Cinnamon Clove Soap. Leah’s background in the arts informs her beautiful designs so you can enjoy the ultimate body product experience or give as a gift. Cousins Jude Goldman and Reuben Schwartz were destined to create a brand since childhood. Both with backgrounds in creative cooking and visual arts, Jude and Reuben love to create healthy and beautiful dishes. Vital Eats unveils bold, dynamic flavors using only plant based ingredients. All products are vegan, vegetarian, gluten free, dairy free, and 100% free from any artificial preservatives.